I realize I just posted this image in my previous entry, but I think it’s worthy of a separate post. Frankly, I’ve had it in my collection for a while but for some reason I didn’t post it at the time I added it. So I’m making up for the past omission. I think it’s worthy of adding a separate entry because their story is interesting. Count Rosebud was an Italian named Primo Magri. He and his brother Giuseppe (or according to some accounts, Ernesto), Baron Littlefinger, were allegedly given actual titles by Pope Pius IX. They toured as performers. In 1885, Count Rosebud married the widow Thumb, Mrs. Lavinia Warren. They had to perform into old age because they supposedly had very lavish tastes and could not afford to retire. 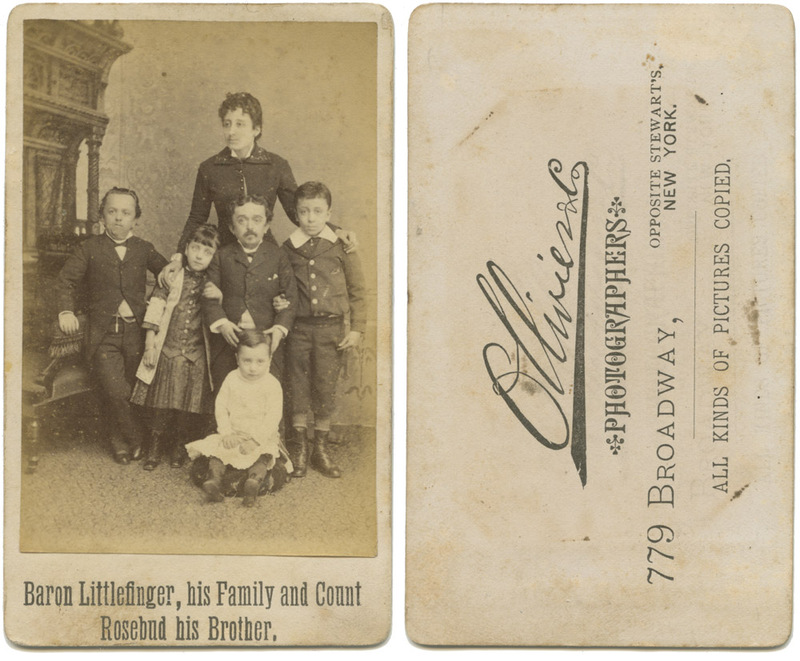 I haven’t seen any back story on the rest of the family referenced in this photo – who were they, were they really the Count’s family or just props like the Thumbs’ baby, did he divorce this woman at some point before marrying Lavinia, or was he a widower?